If the New Year has brought about awareness of something you would like to release from your life (something that's been bothering you or something no longer needed), a simple daily ritual of fire magic can help. First you will need a firebowl and firebowl ingredients. When choosing a firebowl, look for one that is made of brass, cast-iron, ceramic or a hard hardwood. It should be 4-6 inches in diameter and 4-5 inches deep. It should also be a shape that is easily held with one or both hands and light enough to carry in one hand if necessary. Make sure your firebowl is of a shape that will be stable when placed on a flat surface. The shape of the bowl should also be curved-in and flared back out at the top rim to promote "columning" of incense or smoke. To use your firebowl you will need to fill it with ground fire clay or clean, fine sand. Non-scented cat litter (which is ground clay) works well as long as it does not have chemicals or deodorants in it. Put 1-2 inches in the bottom of your firebowl as an insulator to protect the firebowl itself, your hands and any surfaces from the heat. You will also need some self-starting charcoal disks. These can be purchased from religious supply stores or online (we have them in our school store too). Round charcoals with bowl-shaped depressions in the middle are the best to use. There is a kind with pie shaped depressions, but we find these do not work as well. You will need wooden or paper matches to light your charcoal. The scent and energetic side-bands associated with butane and other petroleum products change the fire-band you are working with so don't use lighters to light the charcoal disk. You will need to collect or purchase pine resin to burn on the charcoal disk as well as finely ground or rubbed sage. If you collect sage, you can grind it in a blender or coffee grinder. You also need to collect some finely chopped or shaved wood chips or tree bark. This is used to insulate the charcoal from the pine resin or incense that you burn in the firebowl and to facilitate the burning of the materials you use in your firebowl. You will sprinkle the shavings on the charcoal and then put the pine resin and sage on top of it. The last thing you will need for this exercise is a Sun Yellow utility candle. Make sure it is pure sun yellow colored without any orange tones to it. An unscented candle is best to use. Charging your firebowl programs it for a specific purpose. Since magic is a precision science, charging your firebowl for certain operations makes it more effective by stating the intended purpose and programming that into the tool. Charging is not an invocation or prayer to spirit-beings or deities, just a program. Here is how to charge your firebowl. 1. Stand or sit in the South facing North with your firebowl and materials in front of you. 2. Light your Sun Yellow utility candle with a wooden or paper match. 3. Light another wooden or paper match from your candle flame and use this to light the charcoal disk. The disk will begin to spark within seconds. If the charcoal is old or damp, you may need to use metal tongs to hold it over the flame for several minutes or light the top of it in the center of the bowl-shaped depression. Most of you will realize that once the disk is lit, you don't touch it with your hands, but for beginners who have never used one before we like to add this word of caution – It is hot, just like a charcoal on a BBQ grill. 4. Once the charcoal sitting in your firebowl is lit, pull Sun Yellow energy from your utility candle into yourself and blow it out onto the disk. 5. Add the wood shavings onto the charcoal, then the pine resin and finally the sage. 6. Wait for it to produce a good column of smoke and add more sage or resin if needed. 7. A voice of command should be used when saying the charge verse. The verse will vary according to what you are programming the firebowl for. Here is a basic firebowl charge verse (used for a house cleansing) and then some substitutions you may want to use in creating a verse specifically for this exercise depending on what you are releasing from your life. Not in accord with me! Far from here send baneful trace! Thus my will, so it be!" In place of "spell" or "adverse" or "baneful" you can substitute anger, grief, trauma or any other applicable term. For example lines could be changed to "Let no fear nor sickness last" or "Far from here send cancerous trace". Just be sure when applying substitutions of words that you do not disturb the rhythm of the original verse. Now that you have your firebowl and know how to charge it, you are ready to begin the fire magic daily ritual to release what it is that is bothering you or that you find no longer serves you. Everyday write on a small piece of paper what you want to release. Charge the firebowl, and then burn the paper in the firebowl. This works because "Thoughts are things and words have wings." In other words, writing things down makes them more material, more real. 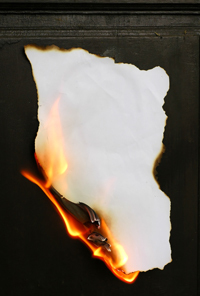 Burning the paper changes the unwanted item into simple fire magic, fire energy, with no negative charge. Sometimes you may have to repeat this ritual for 3, 7, or 11 days before you see change. Be sure to record results in your Book of Shadows to ensure you notice any changes. Magic often happens but we sometimes fail to see the changes. The firebowl is just one of the magical tools that can help you bring ritual magic into your life for a variety of purposes. You can learn more about using magical tools in our online Basic Magic Class or specifically more uses for the firebowl in our Firebowl - Cleansing Tool Ebook.